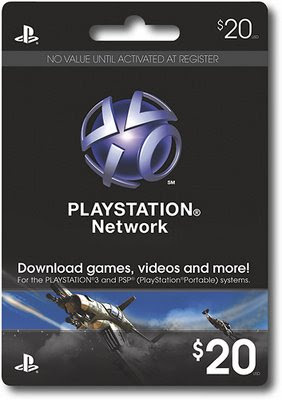 Pre-paid Playstation Network Cards have been available in the U.S. as far back as April 2008. As of last fall the cards started appearing at major big box U.S. stores including Wal-Mart, Best Buy and Sam's Club -- signally a nation-wide roll-out. Up here in Canada though, we've been waiting patiently with no concrete date from Sony as to when they will land on store shelves. After 14 long months it looks like the wait is finally over. Although we still haven't heard a peep out of Sony, PSN Cards have started popping up at EB Games stores across Canada. The denominations that are currently available are $20 and $50. There is no tax on the cards since you pay the tax when you make purchases through the Playstation Store. I contacted EB Games and was told that the cards have been available in Canada since June 12. The cards work the same as Xbox Live cards and Wii Point cards and allow you to buy PS3 and PSP content in the online PSN Store. All you have to do is enter the printed code found on the card to fund your online wallet. For us patient Canadians this is great news indeed. Now we won't have to use our credit cards for every purchase and these cards make great gifts. Let's just hope it doesn't take 14 months to process the PIN codes! I haven't received any official confirmation that they are in Quebec (so far only Ontario, BC and Alberta). I would suggest contacting your local EB Games outlet.